6.90 points at 49 votes (rank 381). You are a pilot of a fighter jet in World War II and you start every level from an air craft carrier. It is your task to destroy all approaching hostile airplanes. Next to the usual pursuit planes, which appear in different formations, now and then big bombers appear, which have to be defeated with several shots. The further in the game you get, the more shots you need for the big ones. But watch out, all the enemies can and will shoot back. If you don't make it to destroy approaching enemies, they will come back by flying with the next wave or they make a loop at the lower end of the screen and come from the back, to turn again on the upper screen. Graphically, 1942 is not necessarily a hit, but there are also much worse ones. The airplanes themselves are relatively well created and also show some detail. However, the landscape is designed very loveless. The water doesn't show any animations or diversification. The landscape sometimes seems like a military strategy map and not like a real landscape. There is a much as no diversification, also much seems to be repeated. The collision control is not necessarily the best, as time and again small bugs appear, so it can happen that shots seem to fly through the airplanes. Whether this is wanted or not is questionable, as this bug happens most of the time, when your own shot fly through the wings of the enemies. You can also see it in the animations below. The game is controlled with a joystick in port 2. Next to the classic left and right, you can also go forwards and backwards up to about the middle of the screen to avoid the hostile airplanes. By using the space key you fly a looping, but you should use them sparsely, as you have only 3 of them. The looping is like a magic cap, because while you fly the looping you cannot get hit. Shooting the big airplanes has - next to points - also the advantage that extras appear, which you need to fly over. Next to a higher fire rate and extra cannons you sometimes receive two fuglemen, so you can triple your fire power. This is primarily helpful in the higher levels, that you have a wide fire wall and you can defeat the big ones faster. You can also get a better dispersion as an extra. You should avoid to fly into the explosions of the hostile airplanes or respectively into your own shots, as this causes the destruction of your own plane. If you have managed level 24, the game starts again at level 1. ...another image from the game 1942. Unfortunately, the concept of the game is very primitive and if you keep in mind every level, you will never again lose as there is no AI. The levels are all identical, when they are repeated. So just keep the formations in mind and in the second round you know what awaits you. Örg: "A supercool Arcade Shooter, is lots of fun and causes high spirits. Graphically there is (almost) nothing to criticize for that time." Sledgie: "An arcade classic. Briskly programmed, it is fun. However, it gets a bit monotonous after a while. Music is well programmed." Rockford: "In fact it is a nice shooter, but with a mortal sin for shooters: the collision query is crap, my shots go too often through the enemy, bummer." mombasajoe: "Graphical drabness, weaknesses in the collision query, neither single highlights nor diversification. It needs more for a good game than a nice title music and graphics. It found it stark even then. 4/10." TheRyk: "Nice, not more, but not less. Blue Max is two years older and plays one World War earlier, but is for me the better game. I give 6 out of 10 points for 1942." Robotron2084: "The already mentioned HORRIBLE collision query ruins this game, as hostile shots and planes only need to get near the player sprite to let you lose a life. Also the sprites are - as in Bomb Jack - much to big and constrain the space of action massively. Furthermore the game reacts to the activation of the looping that was thought as a life rescue as clumsily as a stoned elephant. Very, very weak game! 4,5 out of 10 points." Blubarju: "While I love the arcade machine, this conversion cannot really enthuse me. Only the music deserves an extra praise. Therefore still 6 out of 10 points from me." Andre2905: "I remember this very well from my childhood days, but I have played it with trainer then, so that many faults did not carry so much weight. Today it is rather weak, but out of nostalgia and due to the great music 6/10 points." 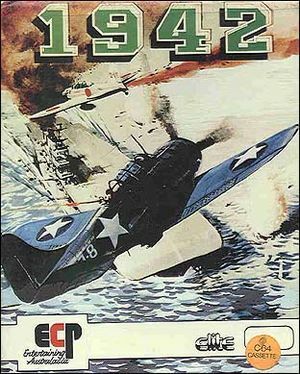 1942 in the Killer List Of Videogames. This page was last modified on 1 July 2018, at 00:05. This page has been accessed 18,177 times.